The popularity of annuities - bought from a pension pot and guaranteeing a fixed, regular income for life - fell after the the shake-up was announced. Since 6 April, retirees have been able to do what they wish with their pension pot, but it may be taxed. 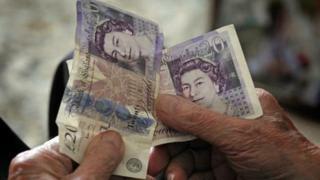 Financial data service Moneyfacts said new retirees would be hit by low rates. Before the pension changes came in those who were retiring could cash in up to 25% of their pension pot as a tax-free lump sum. They then had two options: reinvest their pension pot - or keep their current investments - and take an income from their funds as they needed. The second option open to them was to take out an annuity. The changes that have now come into force mean those due to retire now can do whatever they like with 100% of their pension pot, for example invest in property, although they still only receive the first 25% tax free. After this plan was announced in the 2014 Budget, the sale of annuities plunged. This drop in demand was part of the reason for a 5.7% fall in the average annual income payable from a standard annuity in 2014, according to Moneyfacts. This year, a further drop has taken the income from standard annuities without guarantees to a record low. A healthy 65-year-old with a pension pot of £10,000 would be able to swap it for a standard annuity income of £476 a year, down 5.9% since the beginning of the year. The equivalent person with a £50,000 pension pot would get £2,550, a fall of 6.4% over the same period. "In many cases, retirees looking for a secure income now face the unenviable position of annuitising at the lowest point in the product's history," said Richard Eagling, head of pensions at Moneyfacts. "This is particularly unfortunate for those individuals who may have deferred making a choice until the introduction of the pension freedoms but have since decided that an annuity is still the most suitable product for them."